Education Qualification : Passed Masters Degree in Concerned Discipline from any Recognized University. Eligible Candidates can Submit Application at the Official Website of ASRB latest by 29th November 2018. Applicants First Logon to ASRB Official Website. Click on NET (II) 2018 Link at Left Side of Home Page. 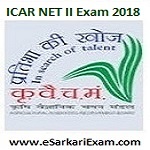 Click on Notification for ICAR NET (II) 2018 Exam Link. Now Click on Online Application Form link.